This unique book provides a comprehensive review of the latest science on a key aspect of appetite control. It brings together contributions by leading researchers worldwide who approach this complex, multifaceted issue from a variety of differing perspectives, including those of food science, psychology, nutrition, and medicine, among others. It is well known that products that require greater oral processing tend to be more sating. At the same time, the orosensory exposure hypothesis holds that flavor and texture in the mouth are critical in determining meal-size. They may act as key predictors of nutritional benefits and so promote better processing of foods. These two related ideas are at the forefront of current thinking on flavor-satiety interactions. Yet, until Flavor, Satiety and Food Intake no book has offered an integrated treatment of both concepts. The only single-source reference of its kind, it brings health professionals, product developers, and students up to speed on the latest thinking and practices in this fascinating and important area of research. Flavor, Satiety and Food Intake provides product developers with valuable information on how to integrate sensory evaluation with product formulation and marketing. It will also serve as a useful resource for health professionals and is a must-read for students of a range of disciplines in which appetite and satiety are studied. 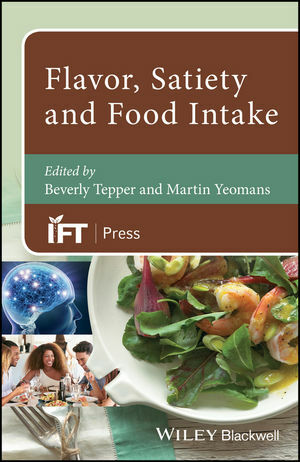 Beverly Tepper, PhD is a professor in the Department of Food Science of Rutgers University, New Brunswick, New Jersey. She is also the Director and Co-Founder of the Rutgers University Center for Sensory Sciences and Innovation. Martin Yeomans, PhD is a professor of Experimental Psychology in the School of Psychology of the University of Sussex, Falmer, Sussex, UK.